Hill Crest Country Guest House Guest HouseHill Crest nestles in a small village just outside of Newby Bridge with amazing countryside views and lovely woodland walks straight from our door. All rooms are individual and beautifully decorated with a well stocked tea tray and home made biscuits, hairdryer, organic toiletries, dressing gowns and slippers. Everything you should need to make your perfect stay. An award winning Bed & Breakfast which nestles in beautiful countryside. Come & enjoy warm hospitality from your host Jane, the delicious breakfasts she cooks & relax in her beautifully decorated well equipped ensuite bedrooms. The B&B is great, comfortable, spotlessly clean and in a beautiful setting. 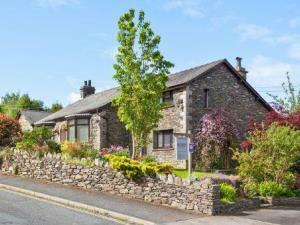 It’s well located, close to Lake Windermere and an easy drive further afield. The service is excellent, from the welcome scones to the delicious freshly prepared breakfasts and the vast fountain of local knowledge from Jane, who can recommend activities, walks, places to eat and much more. Thank you very much for a lovely stay at your house! Thank you Nicola for your lovely review. So pleased our help and advise helped to make your stay really enjoyable. We look forward to welcoming you back somet8me with your little bundle of joy. All the best to you both and hope you enjoy motherhood with not too many sleepless nights. ? ?